what a wild ride this third trimester has been. so many things have been happening behind the scenes here at the Blushing Basics household and while my absence from the blog is not intended i have had to take occasional breaks. a few weeks ago when i was 33 weeks and four days along i went to a doctor appointment to check on baby. while there i expressed some concern about how many contractions i had been experience. for several days i had been having pretty regular contractions and they were not painful but definitely getting uncomfortable. while there in the office discussing this with my doctor i had two contractions during our conversation. he decided to check my cervix and run a NifF test to see if preterm labor hormones were presence. the good news was that my cervix was not dilating but while we waited for the results from the NifF test he sent me over to Labor & Delivery to monitor my contractions and see how frequent they really were. after arrive in Labor & Delivery i was sent to Triage to monitor contractions. while there my contractions continued at approximately one every 6-10 minutes. in an attempt to slow down contractions i was given an oral medication that is intended to help slow contractions. after taking the medication i had an adverse reaction that is pretty unusual for this medication but not unheard of. my heart started racing and i had trouble breathing. before i knew it my heartbeat was at 160 bpm and my racing heart rate and distress from feeling unable to breath caused contractions to strengthen and speed up. after awhile my heartbeat and breathing settled however during that time my NifF test results came back positive indicating preterm labor. with contractions not slowing and my NifF test being positive i was admitted to Labor & Delivery so that i could be put on a Magnesium IV to help slow contractions. there were two main concerns. the first was that because i was not quite 34 weeks all attempts to stop labor would be taken. anything after 34 weeks they do not take these types of measure however since i was just shy of that point i had to be admitted. second, since the baby was too early their biggest drive was to slow labor so that i could receive two steroid shot injections 24 hours apart from one another to help the baby's lungs develop and be strong enough for birth. i was able to make it that 48 hour period for the steroids and was hooked to the Magnesium the entire time. for those of you who have been hooked to a Magnesium IV you know how uncomfortable that 48 hours was. Magnesium feels like you are running a constant fever feeling hot, sluggish and achy with no relief. the benefit was that it worked effectively in slowing my labor so i was definitely willing to go to any lengths. while in the hospital i had several moments where contractions would 'break through' the Magnesium and start speeding up and increasing in strength. each time they would pump me with extra fluids and medications to slow them down again and thankfully every time it worked. by the time i left the hospital i was dilated to nearly a four leaving me returning home to feel like a ticking time bomb. my first week home was really rough. i wasn't on technical 'bed rest' because i had made it past 34 weeks however i was modified activity to prevent contractions from speeding up. it has now been over two weeks since i was admitted and while i had periods of strong, unrelenting contractions none have been strong enough to induce labor. i am so thankful i have made it this far in my pregnancy and this baby has had the opportunity to continue growing strong and healthier inside my belly rather than outside. my goal was to make it past 37 weeks however i think it may be possible to make it to my due date which has me elated. that would be best case scenario. in the meantime i am loving every movement and kick from this little one and dressing this third trimester bump is such a treat. i never thought i could love third trimester this much but i am truly trying my best to embrace every moment i have with this pregnancy as it is my last. the improvements in maternity clothes that have been made in the last several years make dressing this bump so much fun and i will enjoy it to the end. 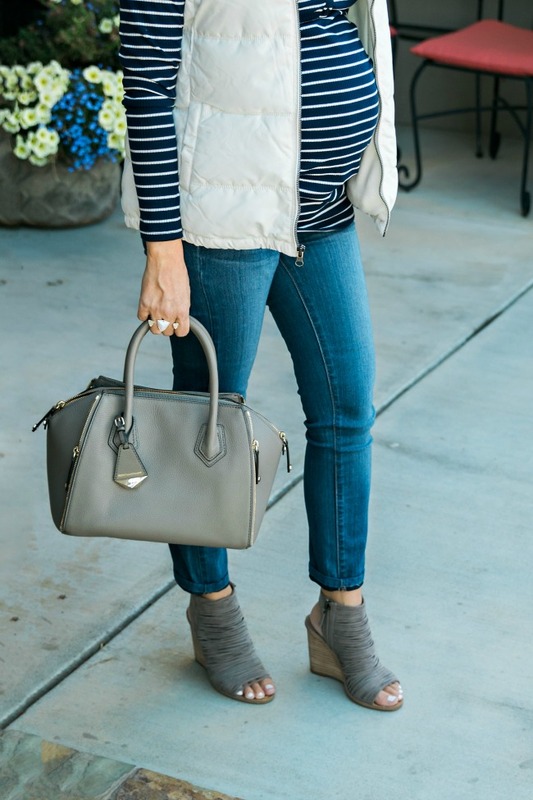 this particular outfit features a comfortable henley top designed by Motherhood Maternity and a puffy vest found at Old Navy. get all outfit details and shopping information at the bottom of this post.